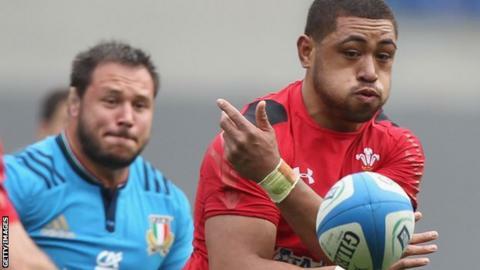 Taulupe Faletau's proposed move to Bath could benefit Wales in the long run, says ex-Wales captain Colin Charvis. Wales coach Warren Gatland has suggested he would not sanction the number eight leaving Newport Gwent Dragons to play club rugby in England. But Charvis says the British and Irish Lion, 24, needs greater competition. "If we're brutally honest the level of rugby that he's been playing at the Dragons week in week out isn't the standard that we need," Charvis said. "So if the option for him to play at a higher level happens to be in England then he's got to go for it, he needs to be playing at the highest level he can possibly play. "But we know he's a very strong home-bird, he loves being around his friends here in Wales." Faletau has won 45 caps for Wales and one for the Lions on their successful tour to Australia in 2013. But despite that experience Charvis - who coached the back-row at Dragons - believes Faletau's consistency at Test level would be helped by playing at a more demanding level domestically. "When we look at him playing in the Welsh jersey nowadays and we're looking for that man-of-the-match performance from him, performing at that level is generally a habit and he needs to be in that habit at club level - he's just not having that at the moment," Charvis said in his World Cup column for BBC Wales Sport. "If he wants to go to Bath, if he wants to stay at the Dragons the decision is his completely, but at the moment he's probably switched from any kind of focus on club rugby to the upcoming World Cup. "In the media it's nice to be able to make a story of things, and Warren Gatland and probably the coaches of the clubs are looking for some longevity, security and stability more than anything. "This is the eternal debate: as a player do you secure your future through earnings or play at the highest level possible, or do you stick at home, stay true to your region and hopefully make Warren's life a lot easier?" Despite the speculation over Faletau's future, Charvis does not believe it will affect the number eight's preparations for the forthcoming World Cup. Faletau has been named on the bench for Saturday's first warm-up game against Ireland in Cardiff, with Gatland naming four new caps and giving some fringe players the chance to stake a claim. "I can remember in 2003 I went to the World Cup and I didn't have a club, let alone two arguing over me," said Charvis, who won 94 caps for Wales and scored 22 tries, along with two Lions caps. "It doesn't affect your preparation, you're still completely focused on playing for Wales and that's your prime directive. "He's been an international now for a few years and he's one of the guys that it's just the right time to put in some stand-out performances." Wales begin their World Cup campaign on 20 September against Uruguay, before facing England, Fiji and Australia in their pool.